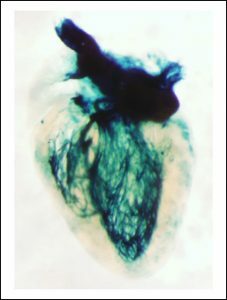 lacZ staining of smooth muscle cells in the heart, in an acta2-optob2AR-IRES-lacZ mouse, see mouse production page for more details and availability. CHROMusTM is directed by Dr. Michael Kotlikoff, Cornell University. A Steering Committee consisting of eleven additional world renowned scientists expert in the fields of cardiac, vascular, lung and immuno biology as well as in fluorescent protein design, optogenetics and gene targeting will meet bi-annually to prioritize and review mouse lines. Once created, mouse lines will be distributed by the resource initially and deposited with The Jackson Laboratory for further distribution. October 24, 2018: New lines are now described on our mouse production page. Note that for some of these we are still confirming functional analysis but it appears the proteins are expressed in appropriate locations. New neuronal lines include dbh-CatCh-IRES-lacZ expressing in sympathetic neurons and Aldh1L1-optoα1AR-IRES-lacZ expressing in astrocytes. New immune system lines include LCK-optoα1AR-IRES-lacZ expressing in T cells and Ly6G-optoβ2AR-IRES-mVermilion expressing in neutrophils. Lastly, in smooth muscle cells we have developed acta2-GCaMP-ER which targets the GCaMP8.1 calcium indicator to the endoplasmic reticulum. Interested in a line not listed? Questions on how to obtain our mice? Contact us! November 1, 2017: A very busy year! We’ve been working through the more than 100 founders produced over the past 12 months. We have multiple new expressing transgenic lines and more to come. Check out our mouse production page to see new information on smooth muscle lines acta2-optoα1AR-IRES-lacZ and acta2-GCaMP8.1-mVermilion; venous system lines HCN4-CatCh-IRES-lacZ, Cdh5-Optoα1AR-IRES-lacZ, Cdh5-optoβ2AR-IRES-lacZ and Cdh5-CatCh-IRES-lacZ; and lung epithelial line SP-C-GCaMP8. September 24, 2016: NEW LINES AVAILABLE! New lines expressed in cardiac, venous, endothelial and smooth muscle systems are now available. Rhodopsin based effectors expressed under control of acta2, HCN4 and αMHC promoters, as well as new GCaMP8 lines expressed under control of αMHC and cdh5 promoters are our latest additions. Visit our mouse production page for more information on these and other upcoming lines. October 16, 2015: New lines available! We have two new lines ready for distribution. acta2-RCaMP1.07 expresses a red calcium indicator in smooth muscle cells. HCN4-GCaMP8 expresses a green calcium indicator in the SA node and AV node. Additionally, other mice previously created in the Kotlikoff laboratory have been added to CHROMus and can be obtained through Jackson Labs. Visit our mouse production page for more information on these and other upcoming lines. January 8, 2015: A new year and great progress is being made. We have founders from 6 transgenic constructs and are now analyzing their expression patterns. We’ve added a lacZ tag to the rhodopsin based constructs to allow for easy detection. August 1, 2014: Dr. Kotlikoff awarded NIH grant to develop transgenic mice useful to the NHLBI community, work begins on the transgenes!